Welcome to Day #4 of Chocolate and India Theme Week. 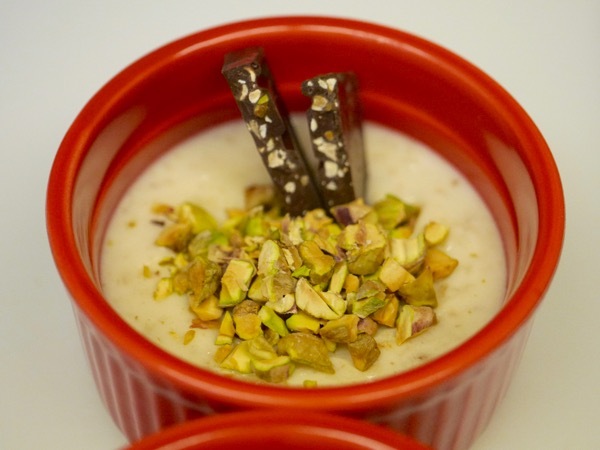 Today I made two versions of kheer (Indian rice pudding), using milk, coconut milk, rice, cardamom, rose water, saffron, pistachios, almonds—all relatively traditional ingredients. 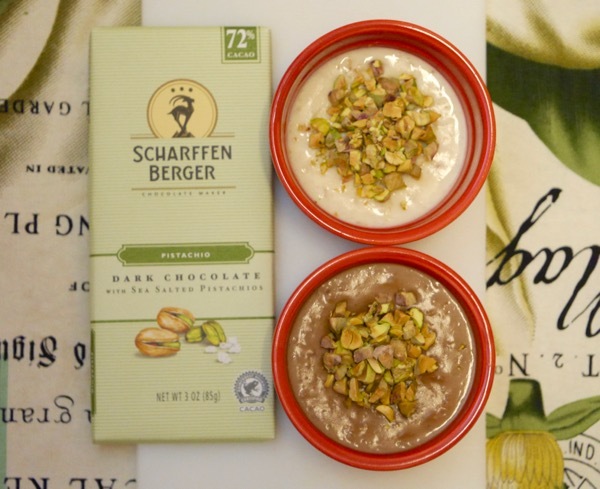 However, one pudding was a "milk chocolate kheer," blended with a melted Scharffen Berger* Toasted Coconut milk chocolate bar. 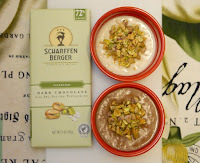 And the second kheer, a more traditional rice pudding, was merely accented with pieces of today's Scharffen Berger Pistachio Dark Chocolate with Sea Salted Pistachios bar. 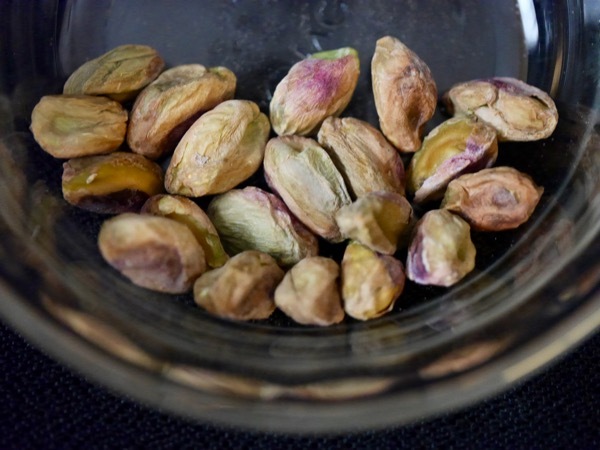 Chopped pistachio nuts have crossed over and become more common atop desserts in the U.S. So, why not a chopped pistachio chocolate bar? Foolish to be sure. But, I enjoyed both versions. The 72% cacao dark Pistachio bar had a rich, bold and balanced roasted and fermented cacao aroma, and it wasn't too sweet. (Thank you.) 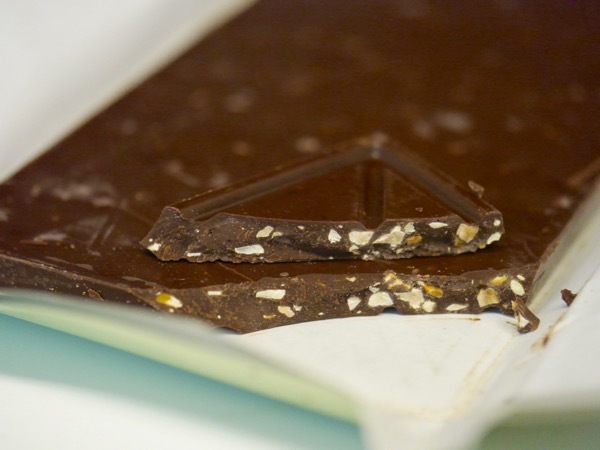 With it's very slight earthy and olive notes, this bar might pair best with dark chocolate brownies or flourless chocolate cake. However, the bits of crunchy pistachio in this bar added some crunchy texture and nutty flavor to this dessert. And the deep dark chocolate pieces contributed a slightly bittersweet contrast to what is traditionally as very sweet dessert. *Formerly a San Francisco Bay Area based company, Sharffen Berger headquarters were moved east some time after Hershey acquired the company.